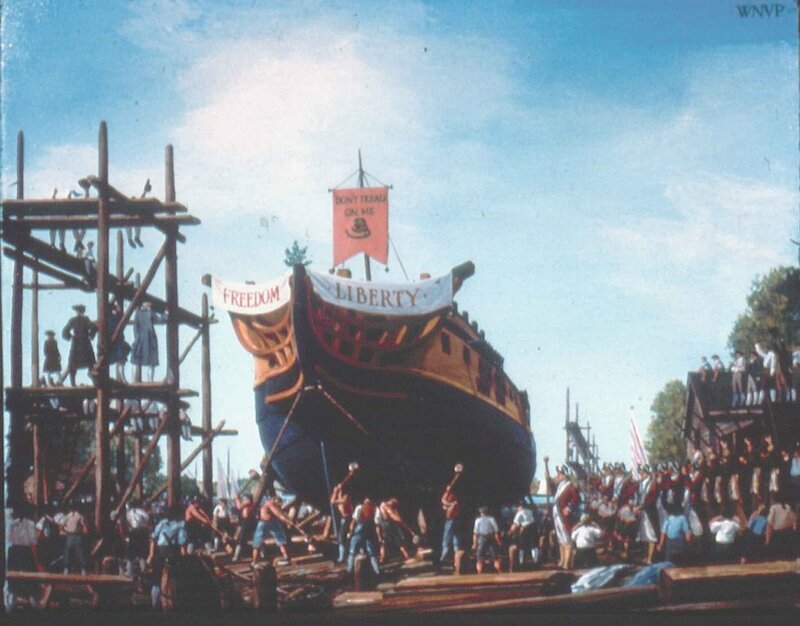 Tactical Voice Radio Call: "JOHNSTOWN"
The first Randolph was a 32-gun frigate whose construction was authorized by the Continental Congress on December 13, 1775. Designed by Joshua Humphreys, she was launched on 10 July 1776, by Wharton and Humphreys at Philadelphia. Captain Nicholas Biddle was appointed commander of the Randolph on 11 July, and he took charge of the frigate in mid-October. Illustration from the Charleston Naval Shipyard, now in the collection of Mr. Palmer Olliff. 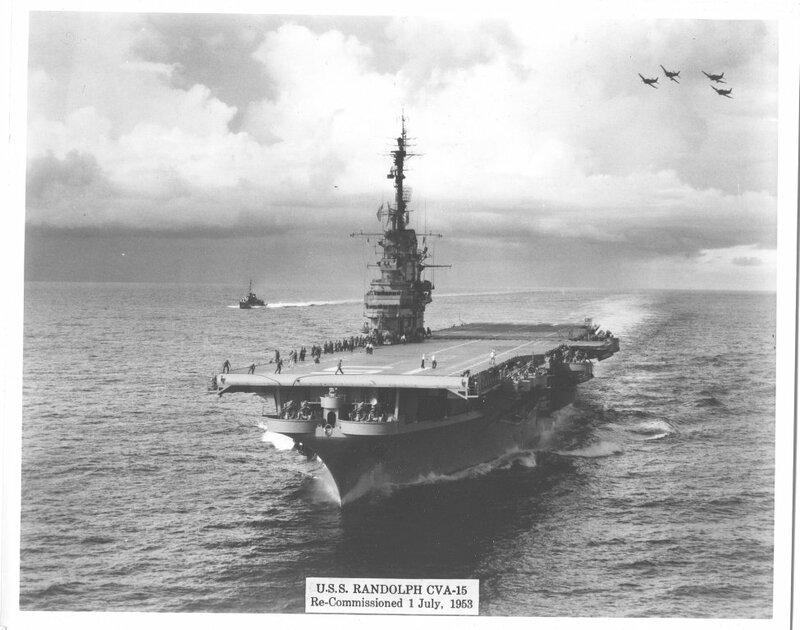 Official U.S. Navy photos of USS Randolph (CVA-15) after her SCB-27A modernization, with an interesting mix of F9F Cougars, AD Skyraiders and F4U Corsairs on deck. 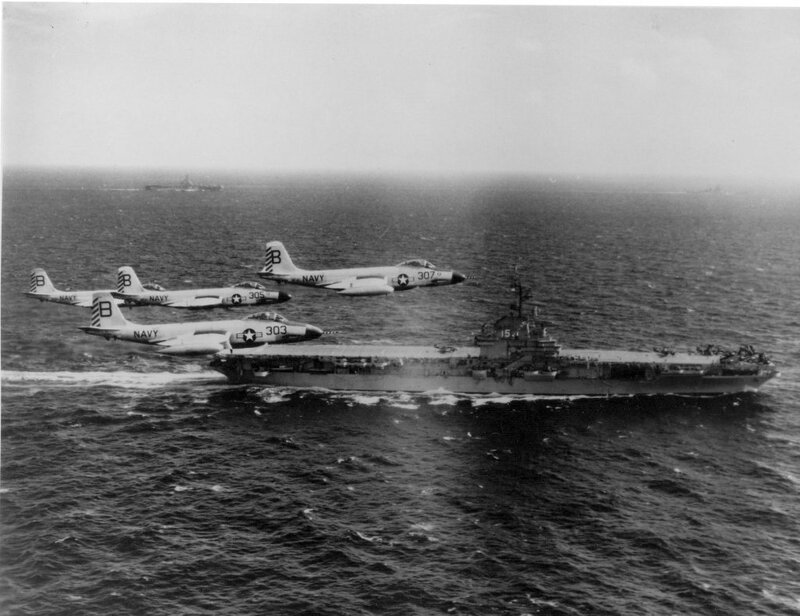 These photos were probably taken during her post-modernization shakedown cruise to Guantánamo Bay, Cuba, August–November 1953, with Carrier Air Group 10 (CAG-10) aboard. 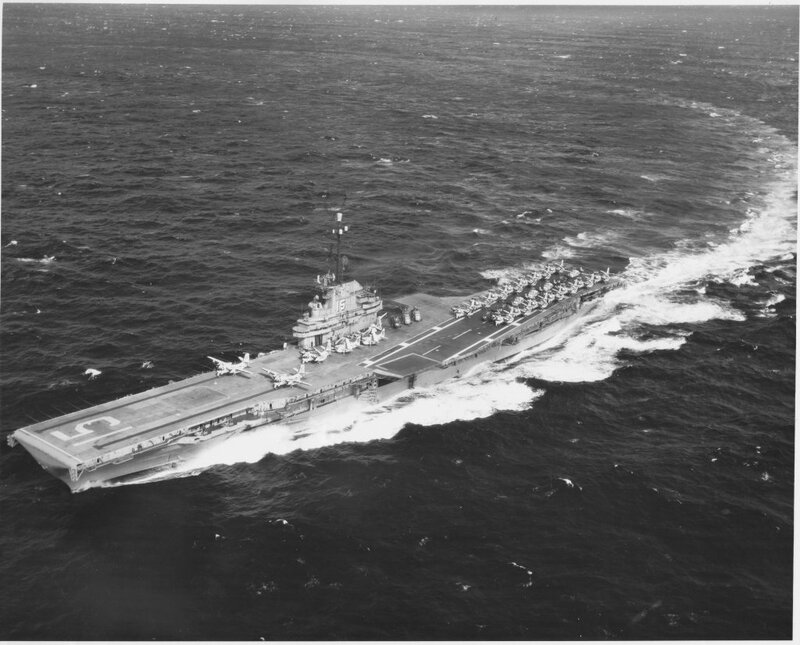 Official U.S. Navy photo of USS Randolph (CVA-15) underway on 2 October 1953, during her post-modernization shakedown cruise to Guantánamo Bay, Cuba, with Carrier Air Group 10 (CAG-10) aboard. Four McDonnell F2H-3 Banshee aircraft of VF-41 "Black Aces" in flight formation over USS Randolph (CVA-15), circa 1954. US Navy and Marine Corps Museum/Naval Aviation Museum, Photo No. 1996.253.7242.001. Robert L. Lawson Photograph Collection. 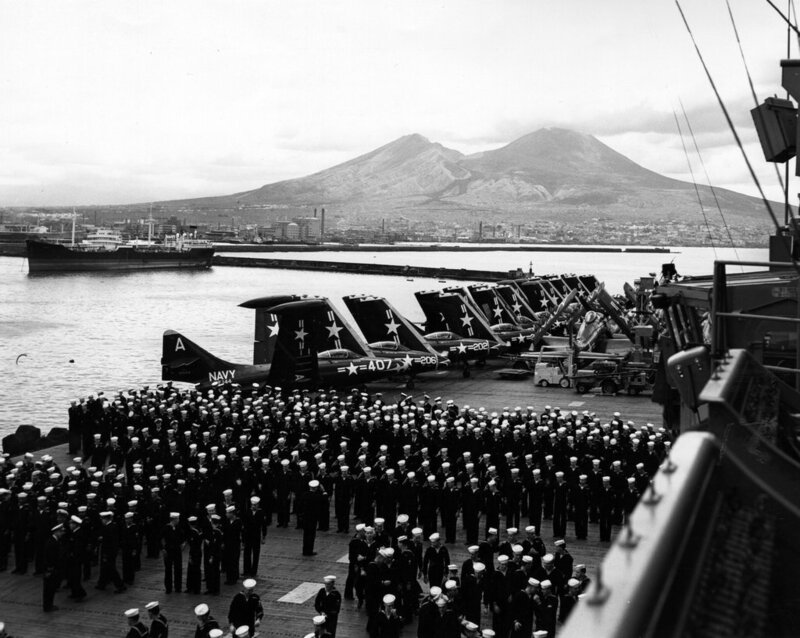 Crew of USS Randolph (CVA-15) muster on the flight deck while the ship was in Naples, Italy on 8 May 1954. 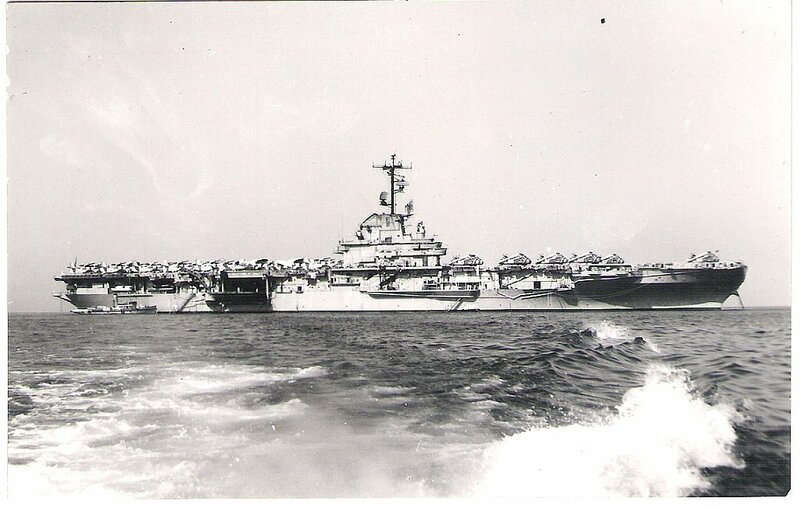 File name: CVA 15 647437-5-54, US Navy Photo, 5/8/54. 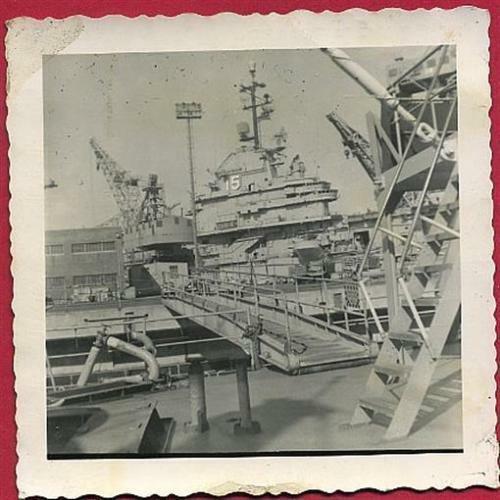 This photo is stamped on the back: "USS Randolph and overhauling machinery at Naval Shipyard Portsmouth Virginia"
A rubber stamp reads: "New York N.Y., U.S.S. 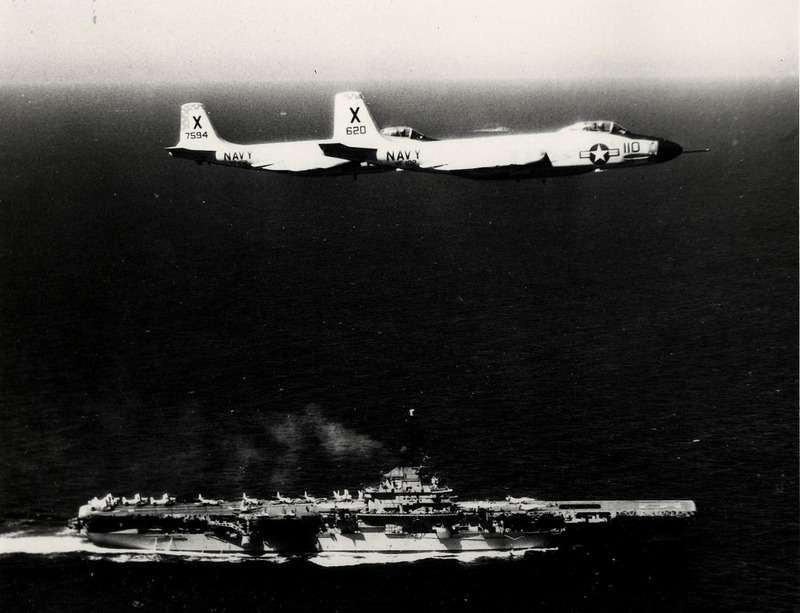 Nantahala, Mar 6 1956"
F2H-4 Banshee of Fighter Squadron (VF) 102 "Diamondbacks" in flight over USS Randolph (CVA-15) in the Mediterranean Sea in October 1956, during the Suez Canal crisis. That month, Israel, Britain, and France invaded the United Arab Republic, precipitating the Suez Crisis. 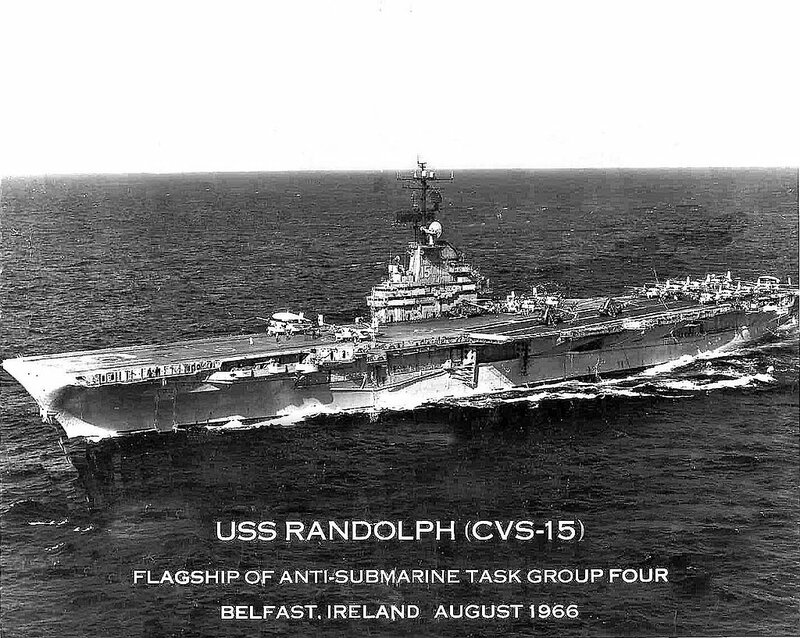 Randolph, joined by other elements of the Sixth Fleet, stood ready. 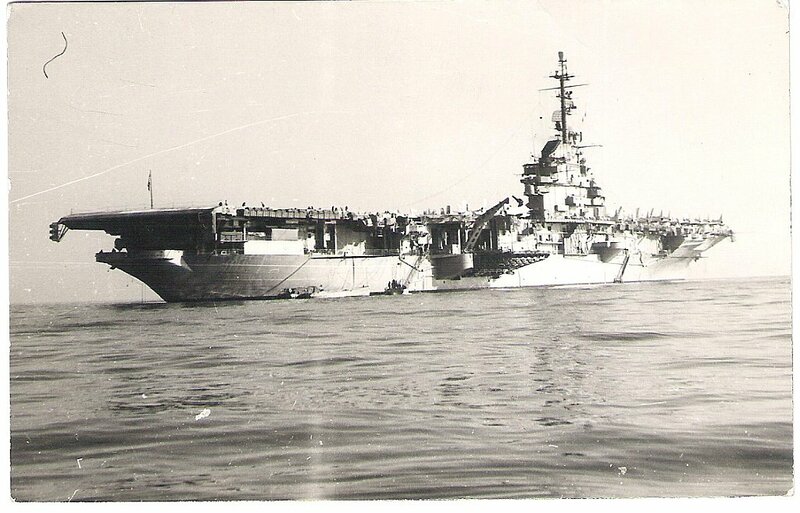 Operating near the Suez Canal, her aircraft provided air cover and surface and air reconnaissance for the evacuation of U.S. nationals from Alexandria. U.S. Navy and Marine Corps Museum/Naval Aviation Museum, Photo No. 1996.253.7245.029. Robert L. Lawson Photograph Collection. 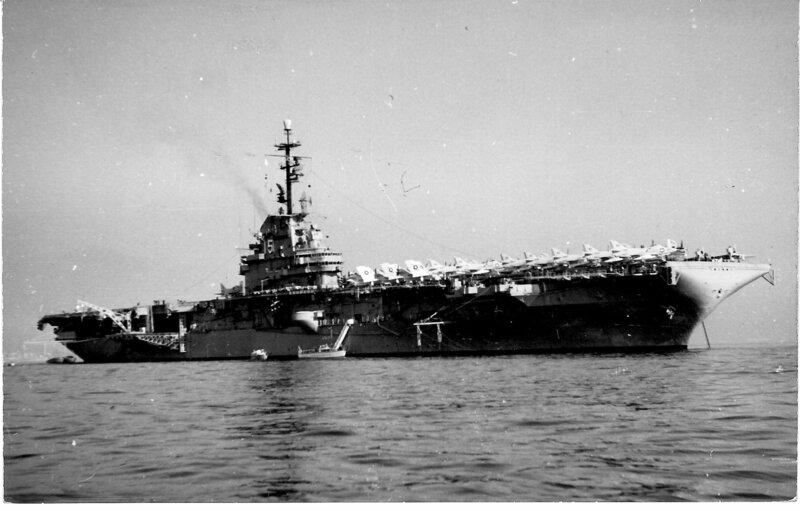 USS Randolph (CVA-15) stands at her assigned anchorage in Hampton Roads, Virginia, during the International Naval Review, 12 June 1957. 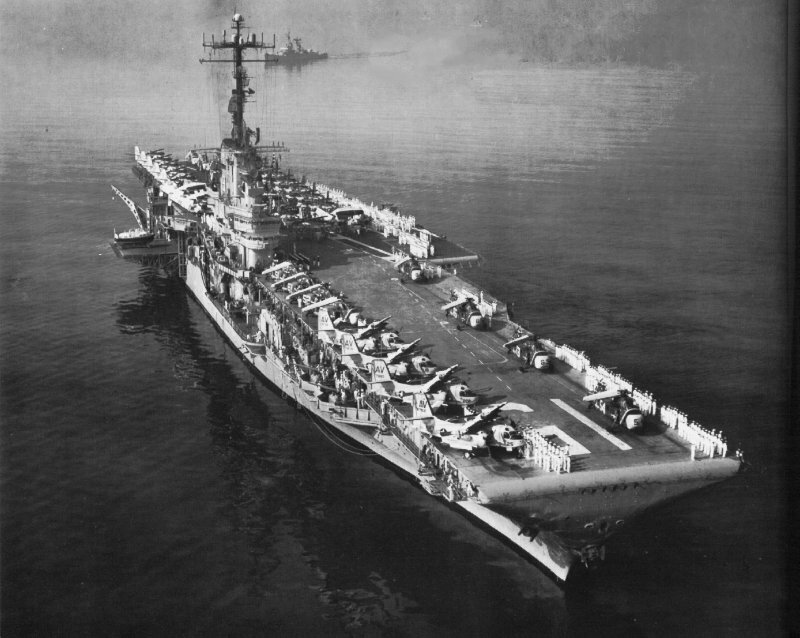 Note her deckload of aircraft, with two AJ Savage attack planes and 14 FJ Fury fighters parked on the flight deck, forward. Photographed by PH2 Hughes. Official U.S. Navy Photograph, from the collections of the Naval Historical Center (photo # NH 97490). A4D-2 Skyhawk aircraft of VA-86 "Sidewinders" conducting in-flight refueling in the Eastern Mediterranean. 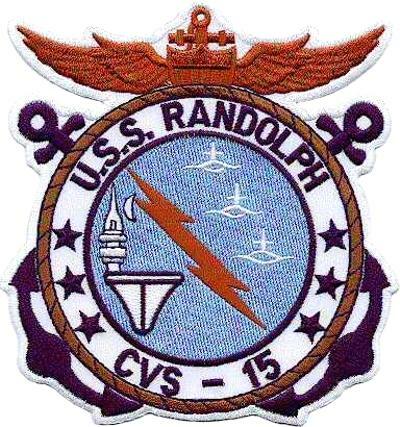 Ship is USS Randolph (CVA-15). 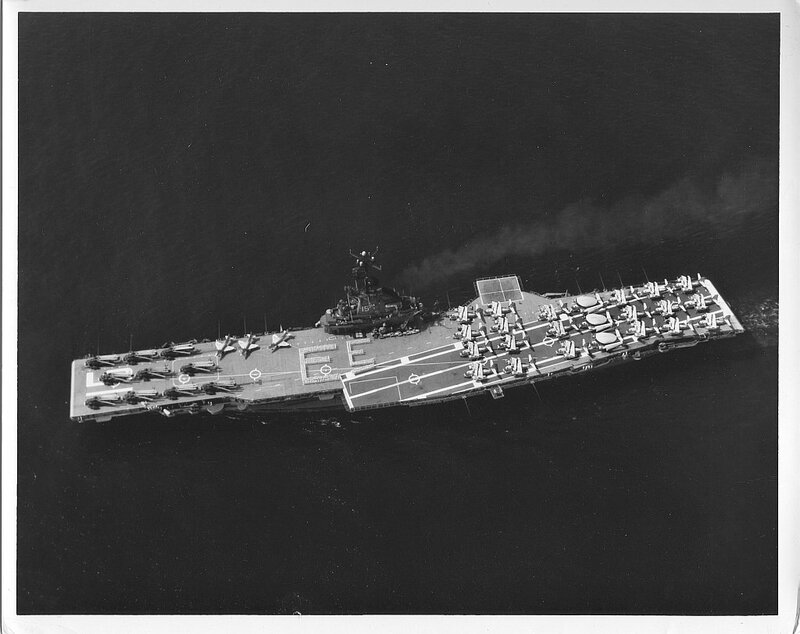 Official U.S. Navy Photograph (#1039207), dated 24 September 1958. 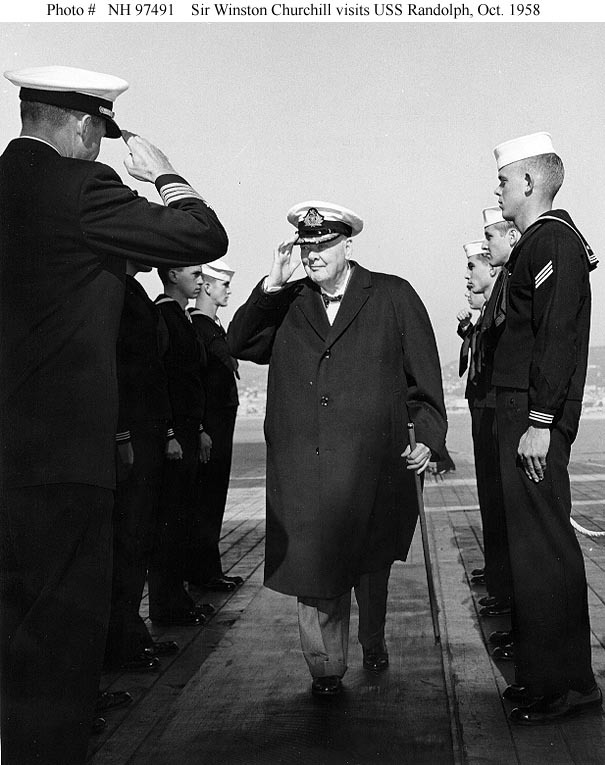 Sir Winston Churchill salutes as he receives honors during a visit to USS Randolph (CVA-15), 26 October 1958. Photographed by J.C. Ricks. Official U.S. Navy Photograph, from the collections of the Naval Historical Center (photo # NH 97491). 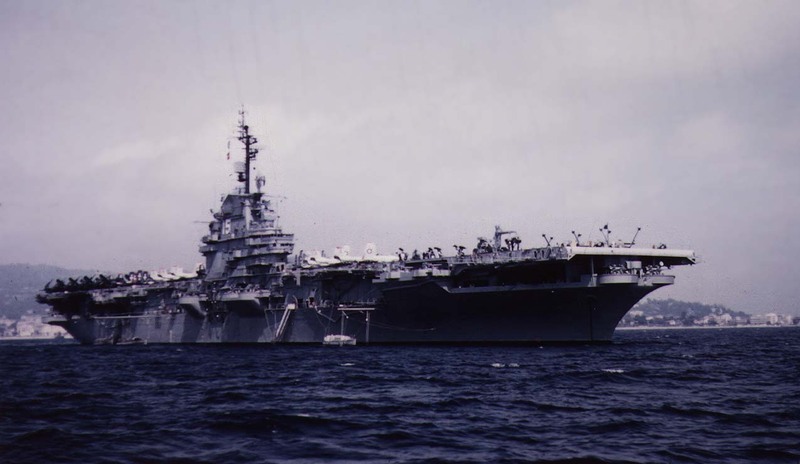 USS Randolph (CVA-15) anchored off Naples, Italy, late 1958–early 1959, during her last deployment as an attack aircraft carrier. 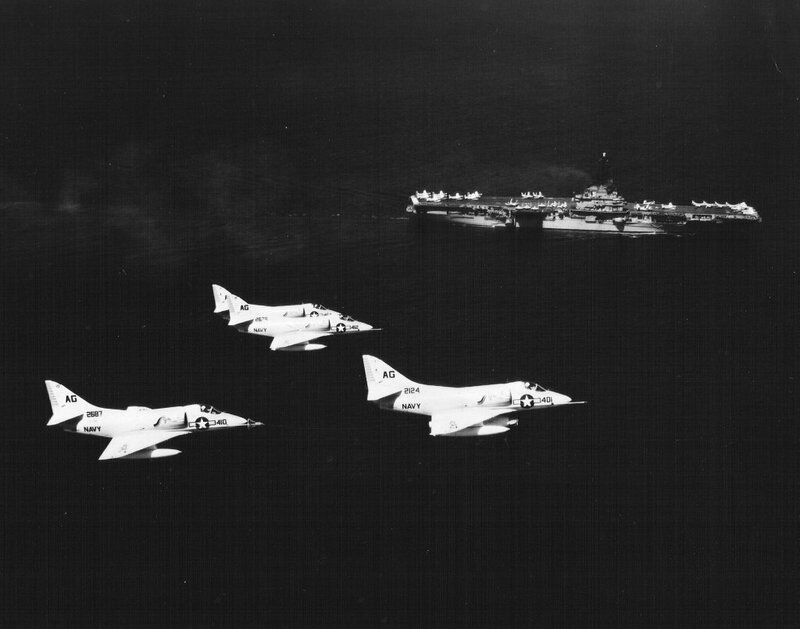 Visible on deck are A4D‑2 Skyhawks of VA-72 "Hawks" (forward, port) and VA-86 "Sidewinders" (forward, starboard), an HUP-2 Retriever of HU-2 Det. 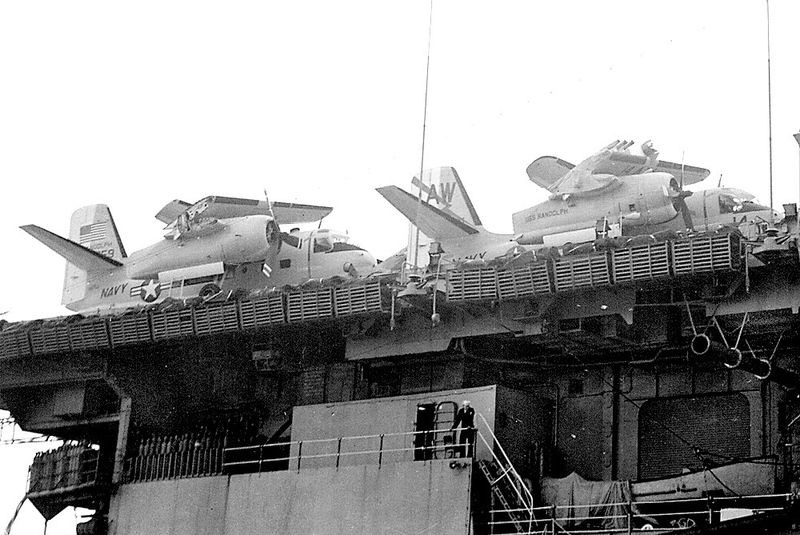 36 "Fleet Angels" (amidships, near the island), and FJ-3M Furies of VF-84 "Vagabonds" on the angled deck. USS Turner (DDR-834) is in the background. 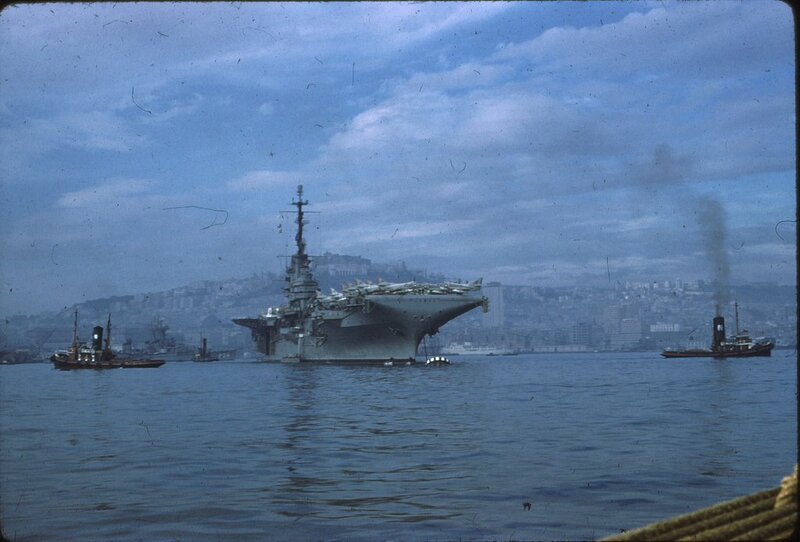 USS Randolph (CVA-15) anchored off Barcelona, Spain, possibly in late December 1958–early January 1959. 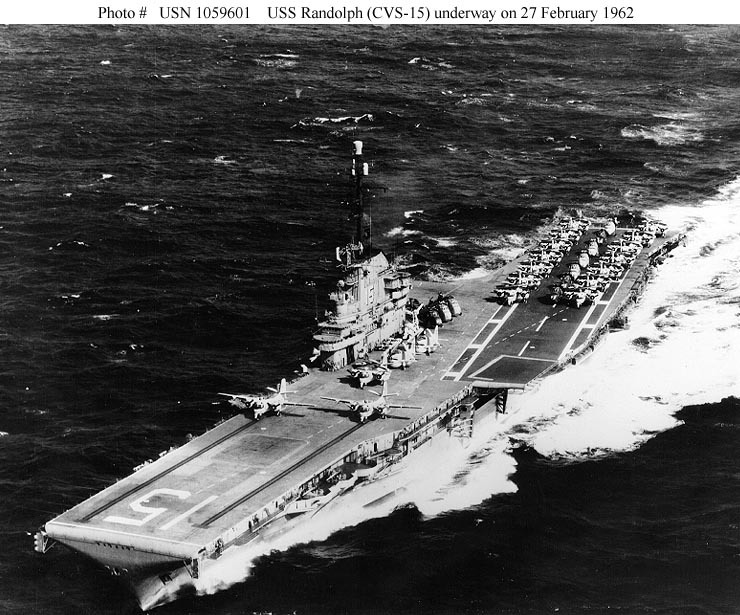 USS Randolph (CVA-15), with Carrier Air Group (CVG) 7, off Barcelona, Spain, in late December 1958–early January 1959. Photo believed to have been taken by F. Ramón Payá. 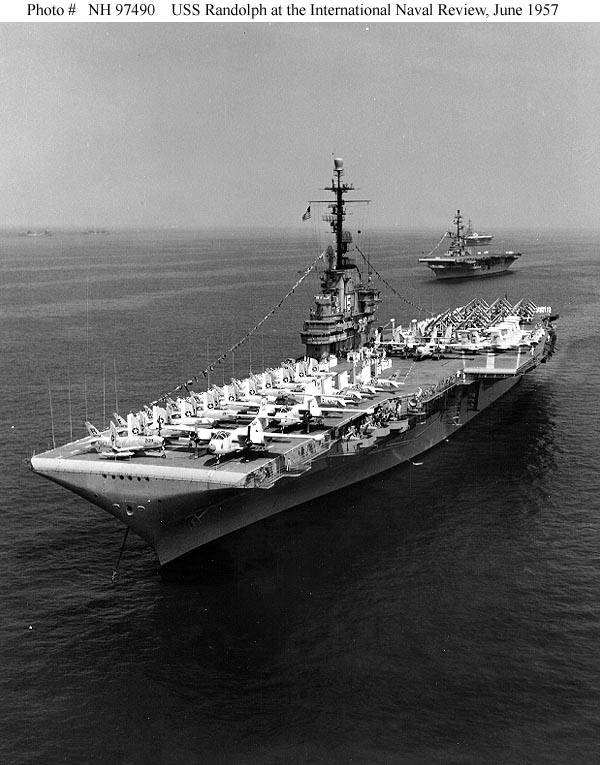 Official caption reads: "USS Randolph (CVS-15) underway at sea on 27 February 1962, with two S2F airplanes on her catapults. Official U.S. Navy Photograph (photo # USN 1059601)." 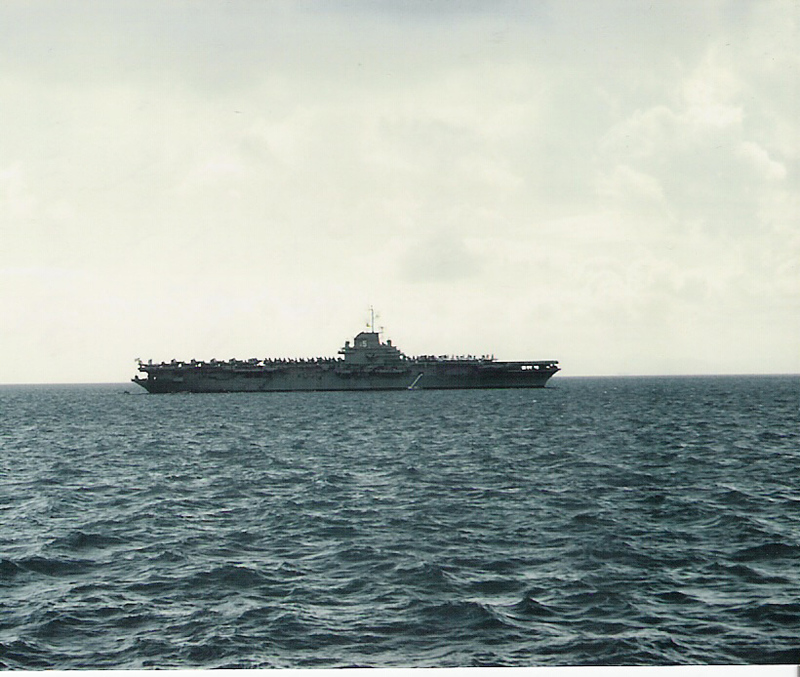 However, the ship's photo lab had this picture cataloged as "CVS-15-2478-L-10-59," dated October 25, 1959: "USS Randolph, CVS-15, making high speed turn." (Thanks to Robert M. Cieri). Another photo taken on 25 October 1959, apparently within minutes from the photo above. 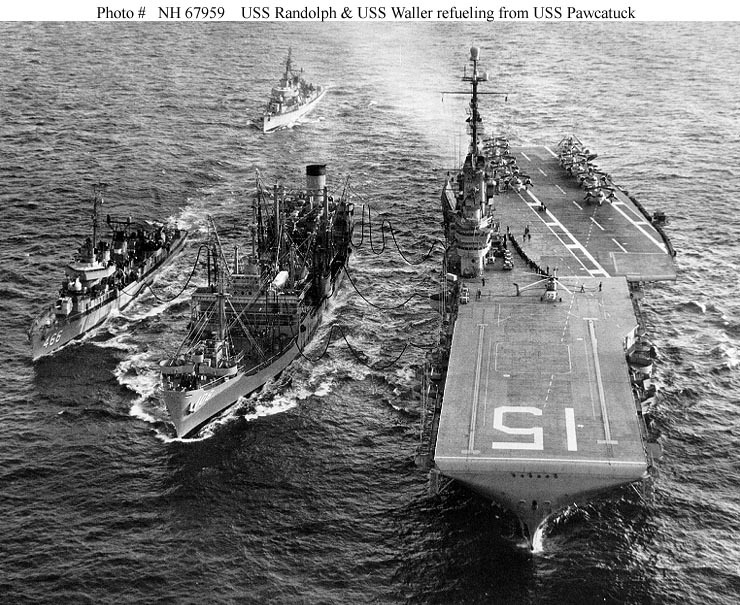 USS Randolph (CVS-15) refueling at sea from USS Pawcatuck (AO-108), circa 1960. 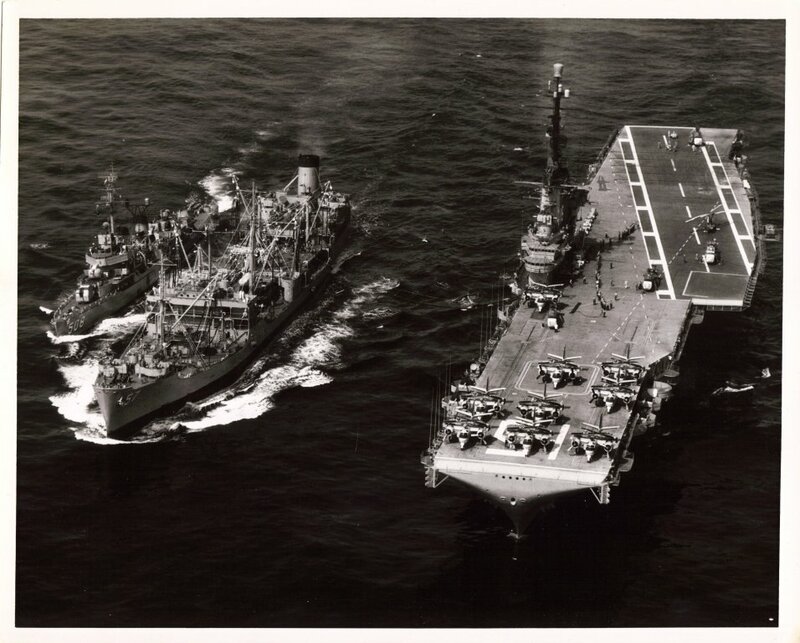 USS Waller (DDE-466) is refueling from the oiler's starboard side, while USS Eaton is steaming astern, waiting her turn for a "drink". 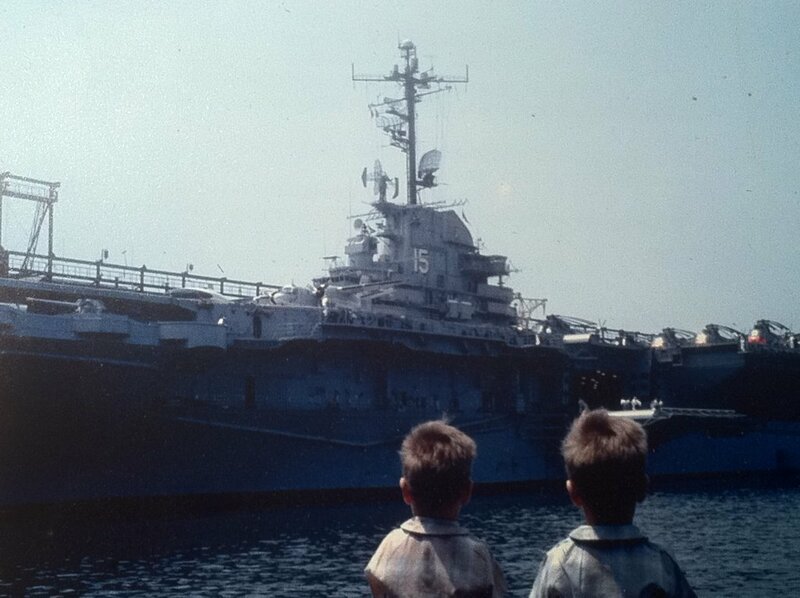 Photograph received from USS Waller, 1969. (Naval History and Heritage Command photo, # NH 67959). 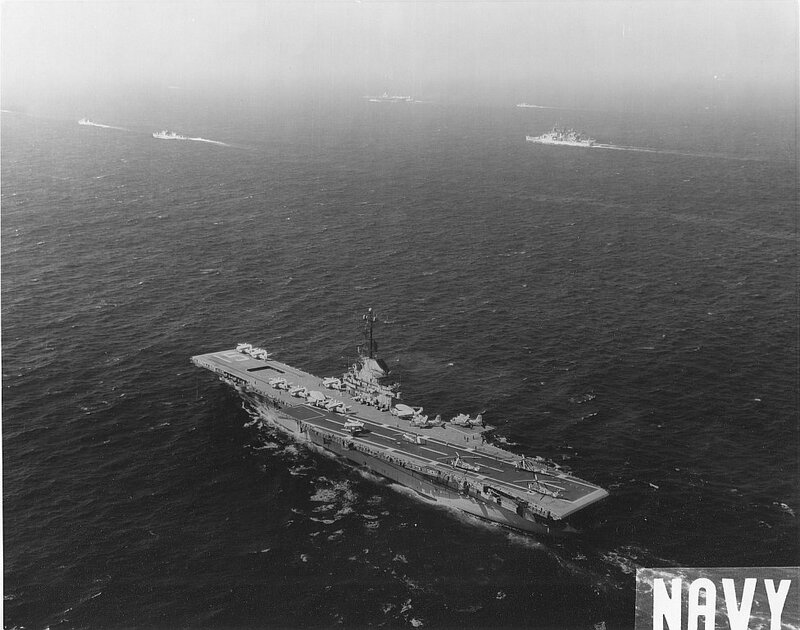 Official U.S. Navy photo of USS Randolph (CVS-15) during an UNREP (UNderway REPlenishment) in the Atlantic, somewhere along the East coast, while conducting ASW (anti-submarine) operations, September 1960. 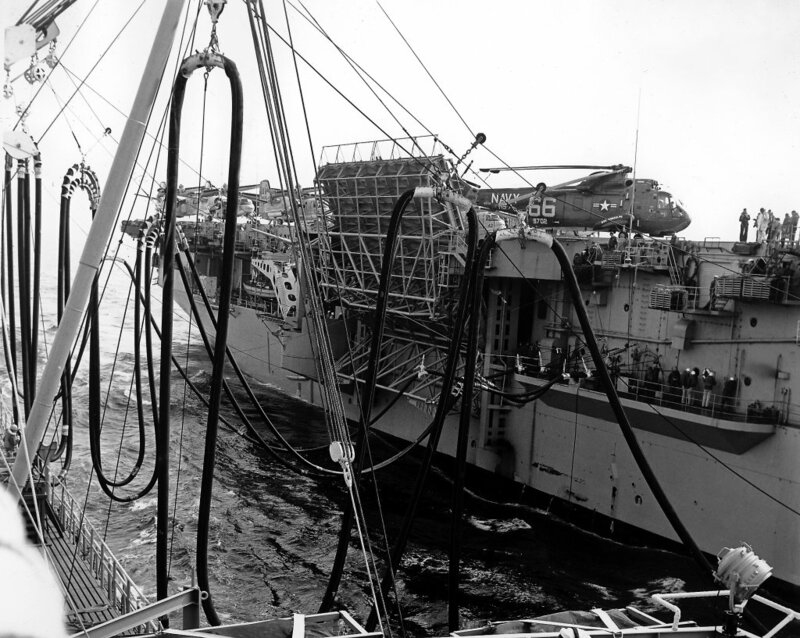 She is replenishing from USS Marias (AO-57) along with USS Cony (DDE-508). Astronaut Virgil I. 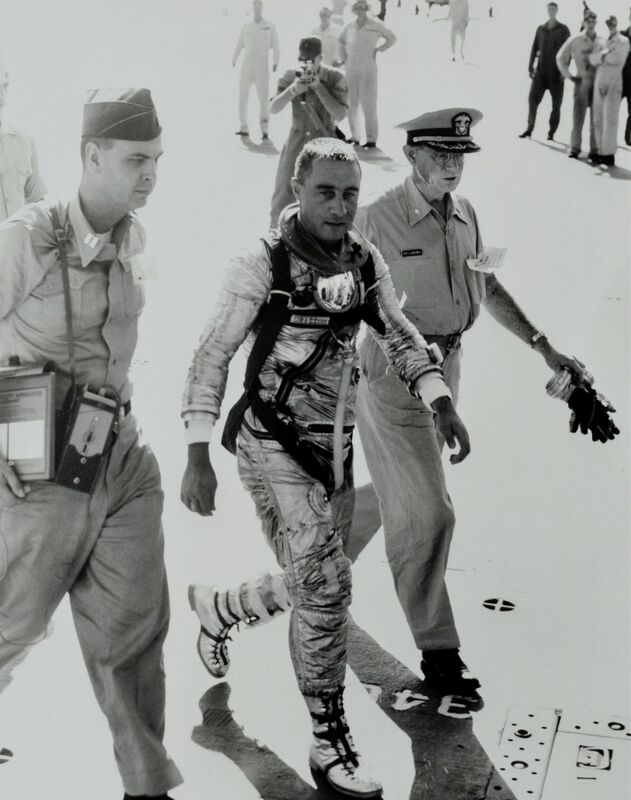 "Gus" Grissom, pilot of the Mercury spacecraft, Liberty Bell 7, arrives aboard the recovery ship, USS Randolph (CVS-15), 21 July 1961, following his 15-minute 37-second suborbital space mission. He is flanked by military medical officers. Grissom's capsule sank soon after splashdown and was not recovered until nearly forty years later. Great Images In NASA (GRIN) DataBase Number: GPN-2000-001332. Randolph hams operating radios in ham shack. 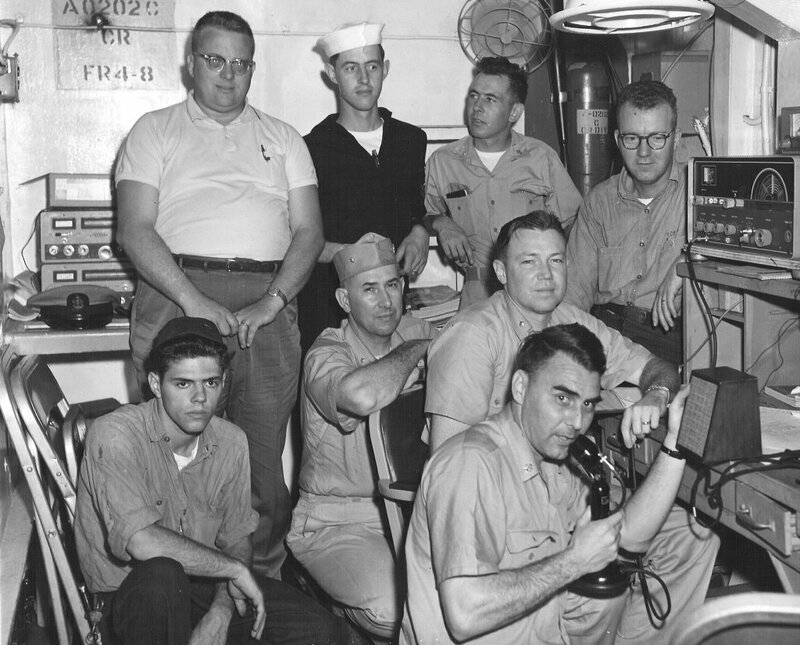 This was the first ham station on a USN combat ship and was set up by CDR Thomas B. Ray (seated), a pilot in HS-7 "Big Dippers" Helo Squadron, on board at the time. Photo is dated 22 February 1962 (Randolph was the primary recovery ship for spacecraft Mercury-Atlas 6 Friendship 7, with astronaut John Glenn, on 20 February). 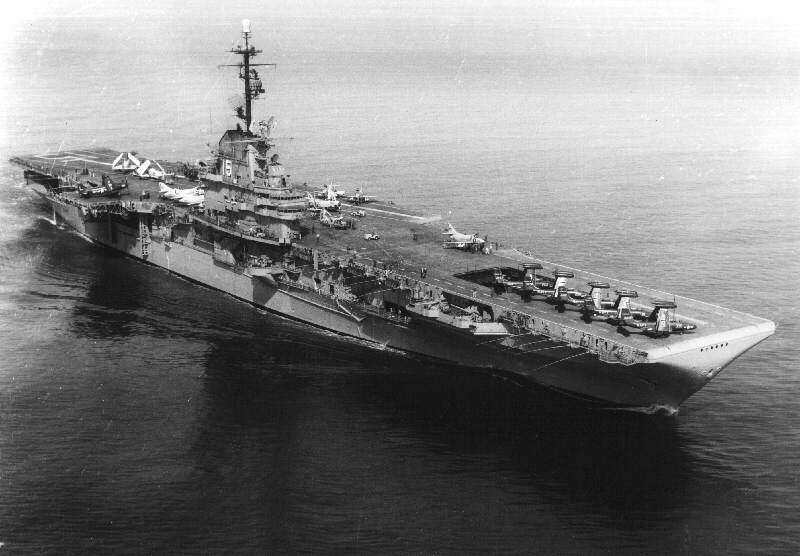 USS Randolph (CVS-15) anchored off Barcelona, Spain, probably in early July 1962, with Antisubmarine Carrier Air Group (CVSG) 58 aboard. As above. Looking forward, from the island. "Willie Fudd" (Grumman E-1B Tracer, VAW-12 "Bats" squadron) launch from starboard catapult, July 1963, off the coast of Virginia. 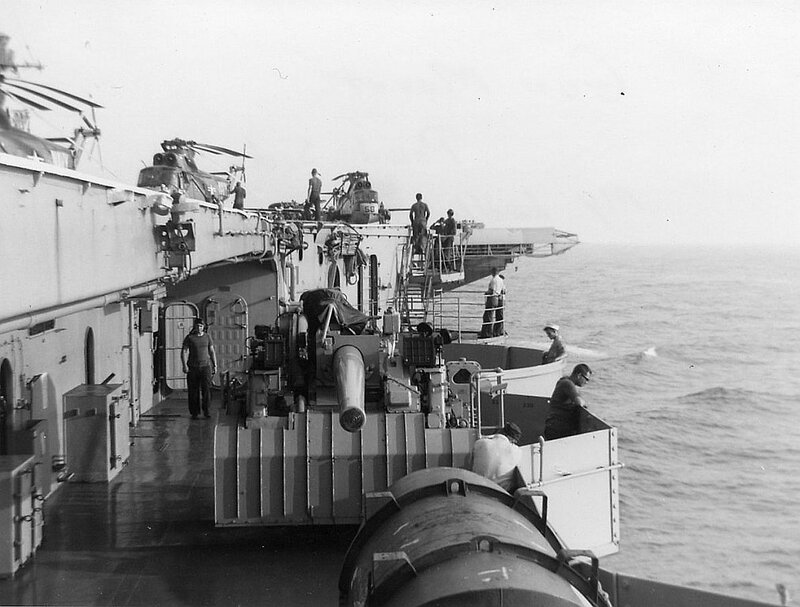 Five-inch gun in the foreground. 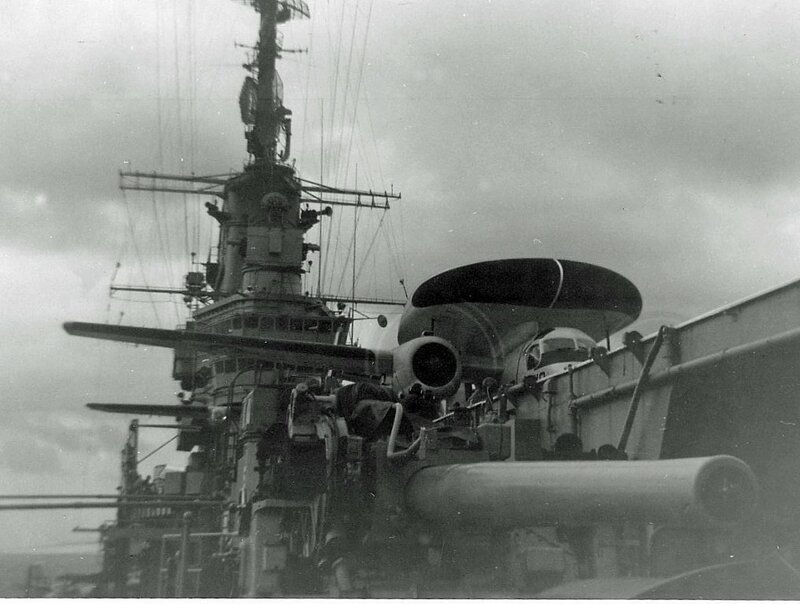 Port side sponson, 5" gun mount. 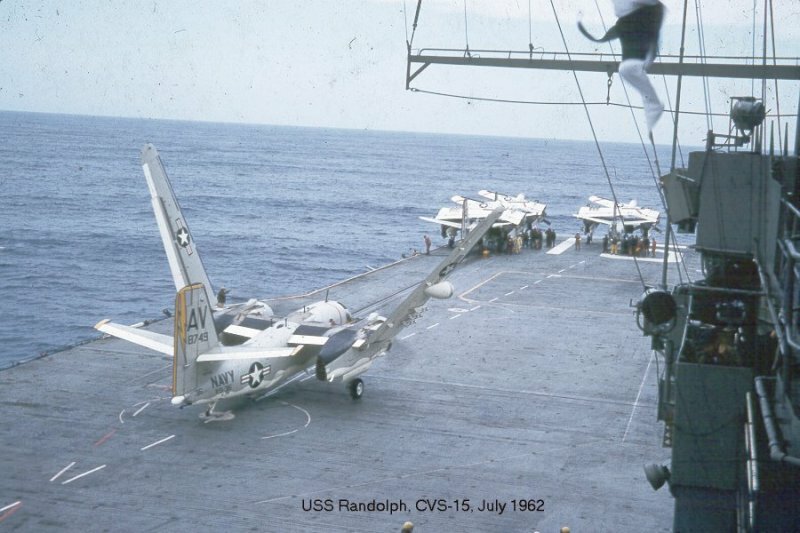 July 1963, off the coast of Virginia. 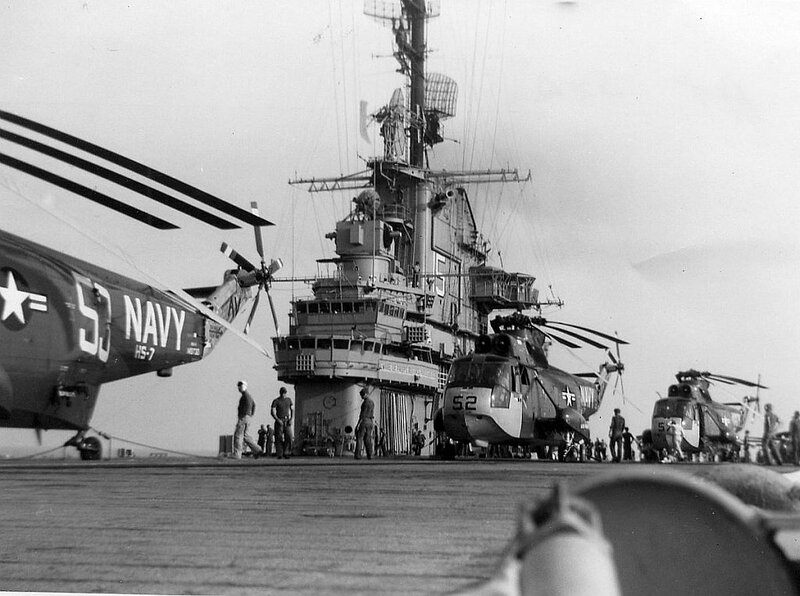 SH-3A Sea King helicopters, HS-7 "Big Dippers" squadron, on flight deck, July 1963, off the coast of Virginia. 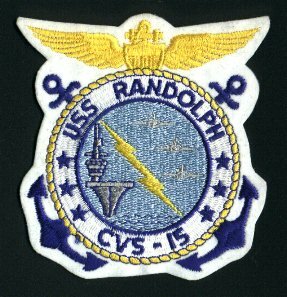 "The crew of the USS Randolph (CVS-15) proudly form their two 'E's, the Battle Efficiency 'E', awarded to the best Anti-submarine carrier, and the sixth consecutive Efficiency Award presented to the Engineering Dept. 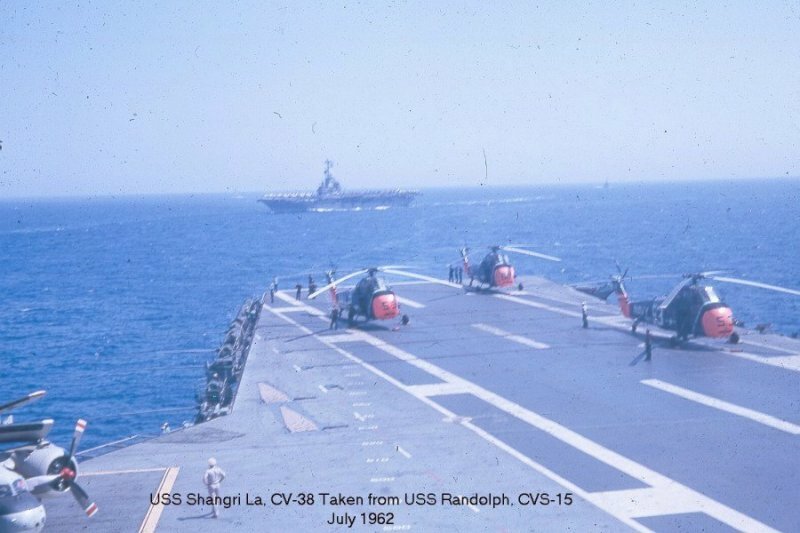 The USS Randolph is the first ship in the Atlantic Fleet to win the Engineering Award six consecutive years." 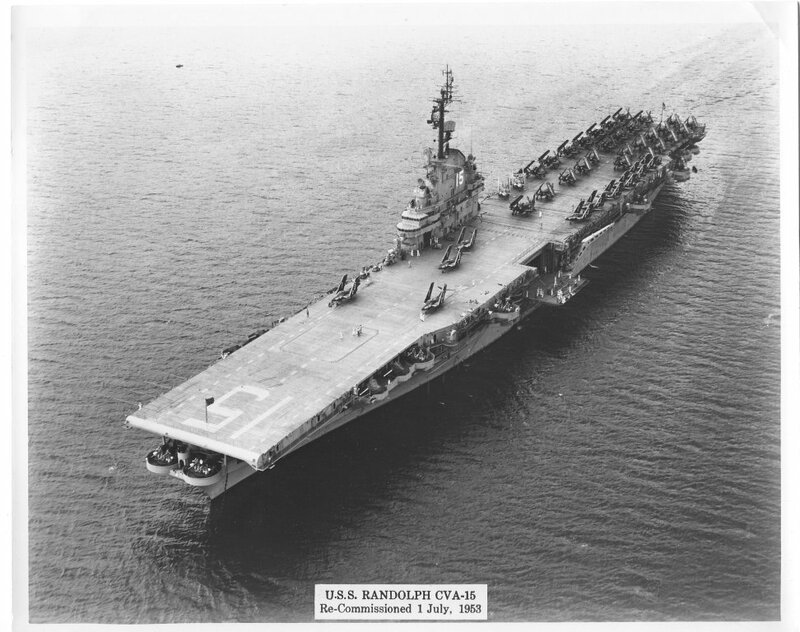 Official U.S. Navy photograph, dated 25 July 1963. 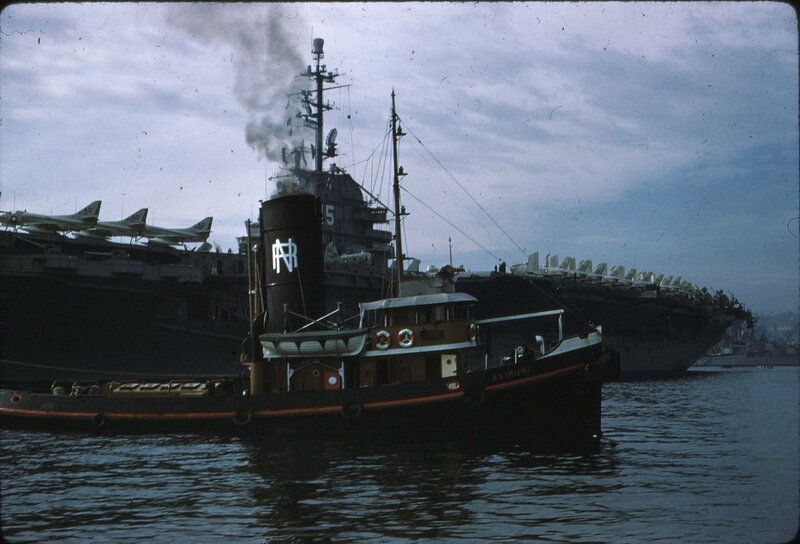 USS Randolph (CVS-15) in New York, mid-1960s, with the Tinschert twin brothers in the foreground. 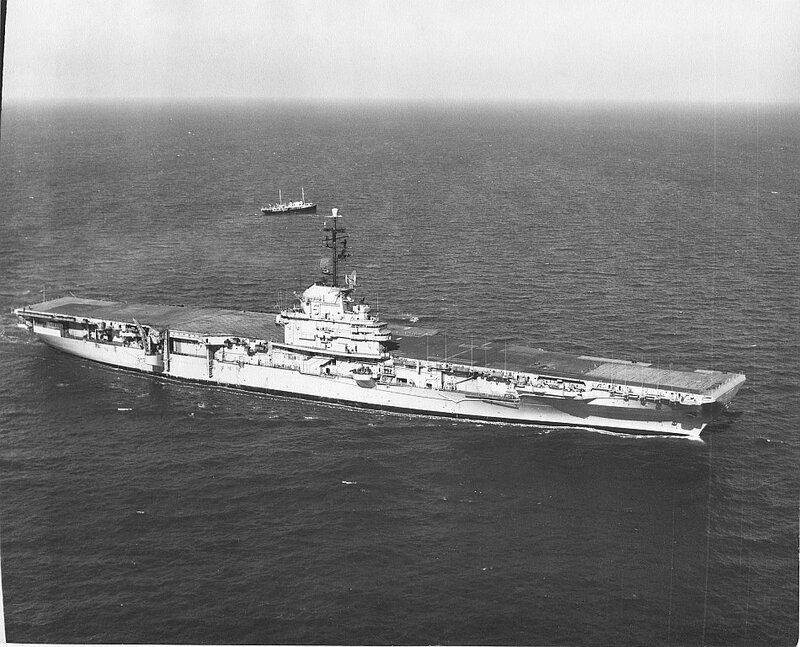 USS Randolph (CVS-15) underway in February 1965, off Norfolk, VA. Randoo Can Do deployed to the Med, February–May 1965, with Antisubmarine Carrier Air Group (CVSG) 58. 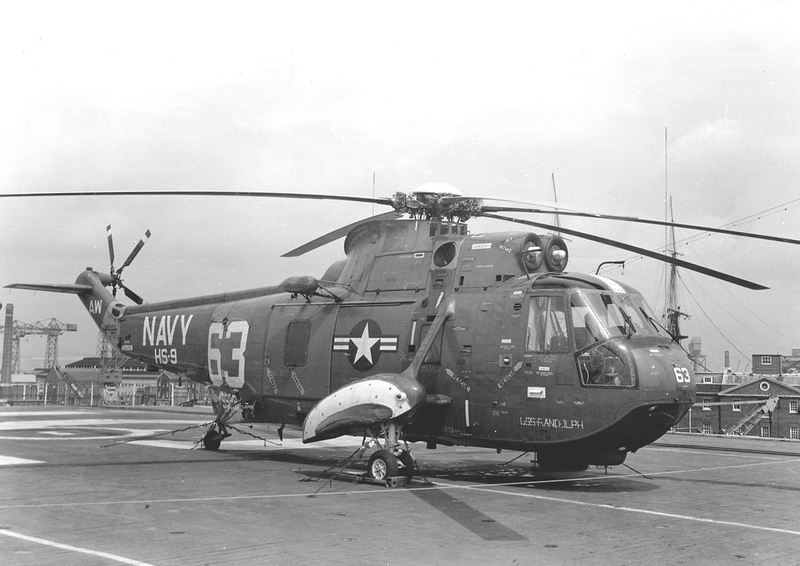 Aircraft on deck are S-2D Trackers of VS-26 "Lucky Tigers" and VS-36 "Gray Wolves," and an SH-3A Sea King of HS-7 "Big Dippers" (this particular helicopter, BuNo 149702, was later upgraded to the SH-3G standard, then SH-3H, then converted to an UH-3H). 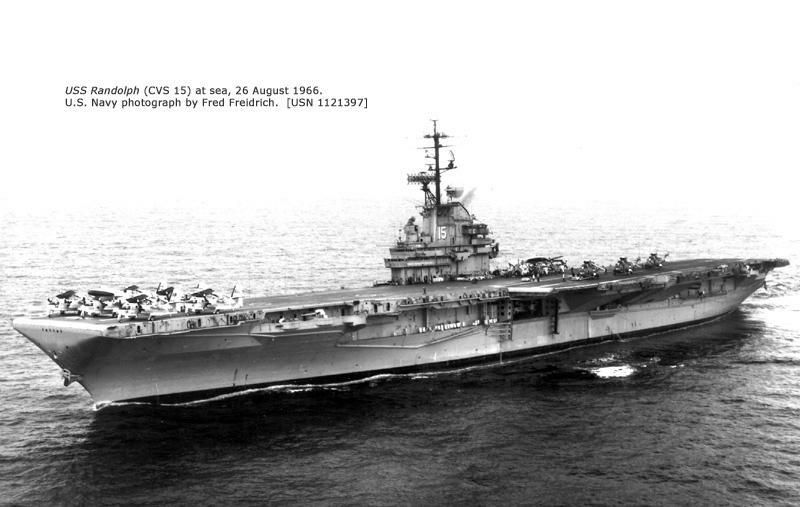 USS Randolph (CVS-15) visited Northern Europe on a good will cruise, May–September 1966. Ports visited were: Belfast, Ireland (August 1966); Edinburgh, Scotland; Bergen, Norway; Copenhagen, Denmark; Hamburg, Germany (July); Rotterdam, Holland; and Portsmouth, England. 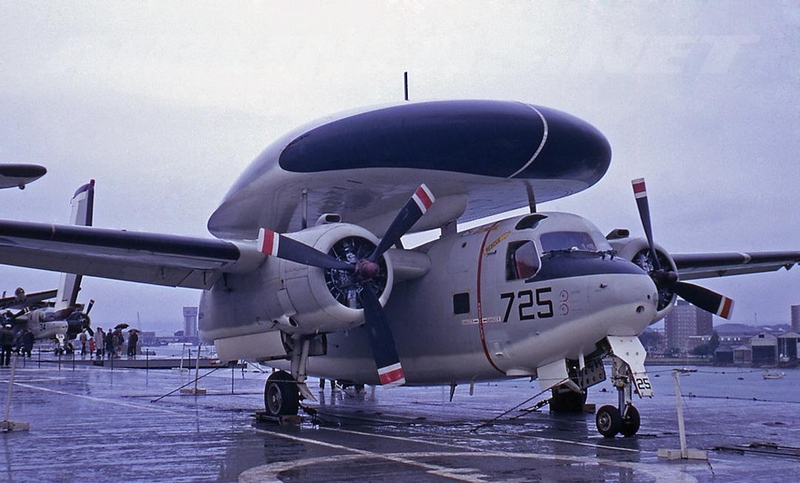 E-1B Tracer, BuNo 148139, modex AW725, VAW-12 "Bats" Det. 15, Antisubmarine Air Group (CVSG) 60, aboard USS Randolph (CVS-15), Her Majesty's Naval Base (HMNB) Portsmouth, 1966. SH-3A Sea King, BuNo 149928(? 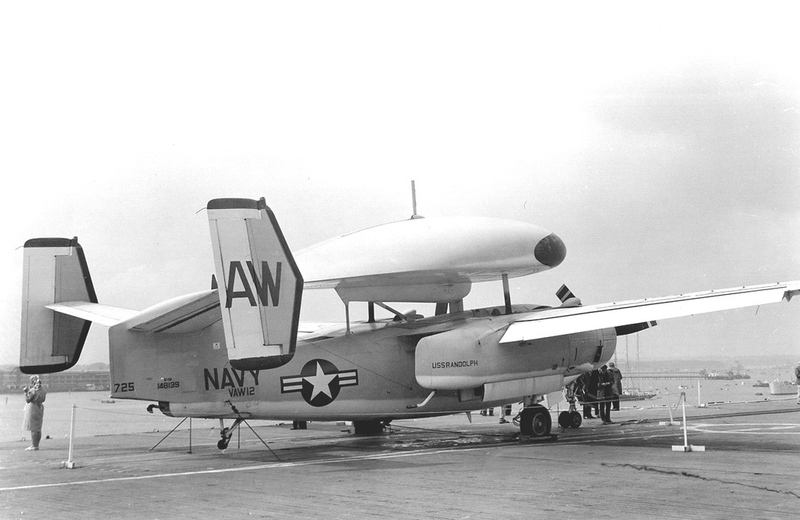 ), modex AW63, HS-9 "Sea Griffins", Antisubmarine Air Group (CVSG) 60, aboard USS Randolph (CVS-15), HMNB Portsmouth, 1966. 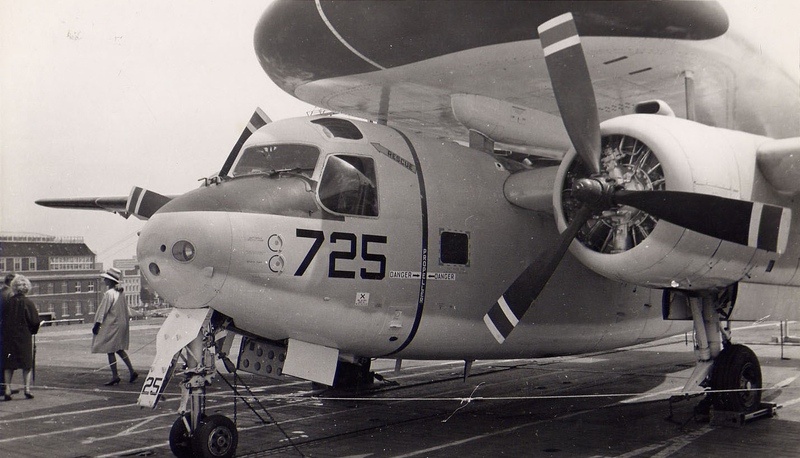 S-2D Tracker, BuNo 148742, modex AW32, VS-34 "Proud Tigers", Antisubmarine Air Group (CVSG) 60, aboard USS Randolph (CVS-15), HMNB Portsmouth, 1966. S-2D Tracker, modex AW34, VS-34 "Proud Tigers", Antisubmarine Air Group (CVSG) 60, aboard USS Randolph (CVS-15), HMNB Portsmouth, 1966. 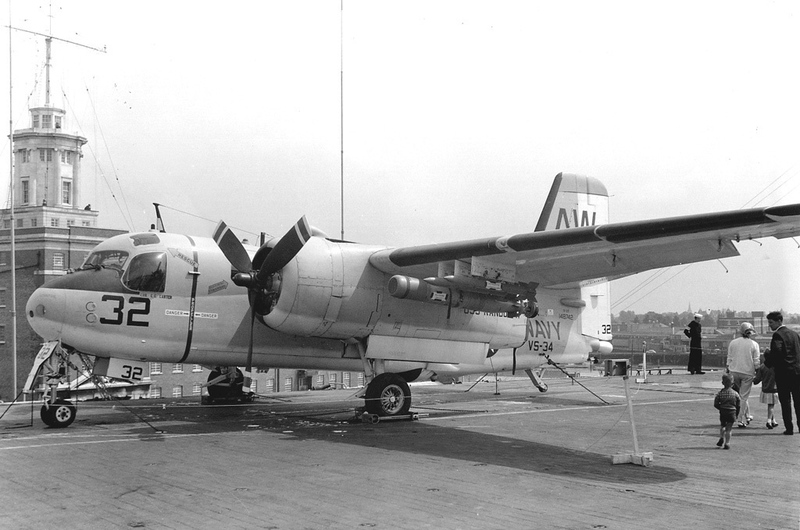 C-1A Trader, VRC-40 Det. 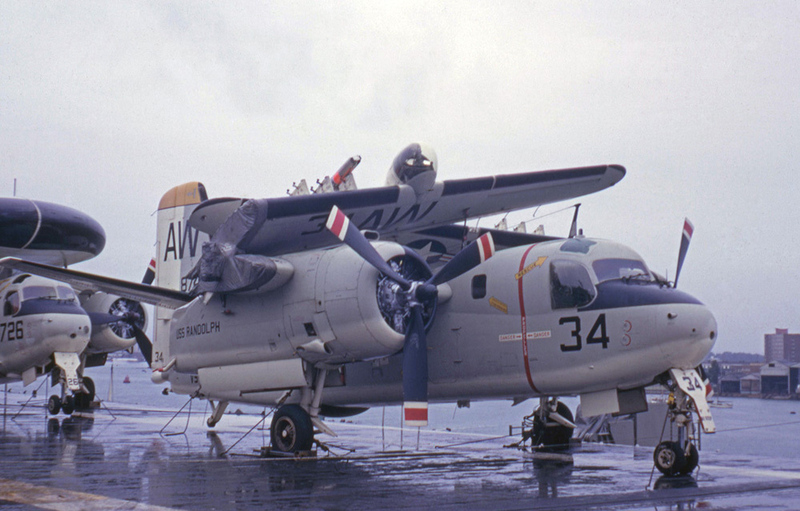 15 "Rawhides" (left); S-2D Tracker, modex AW14, VS-39 "Hoot Owls", Antisubmarine Air Group (CVSG) 60, aboard USS Randolph (CVS-15), HMNB Portsmouth, 1966. 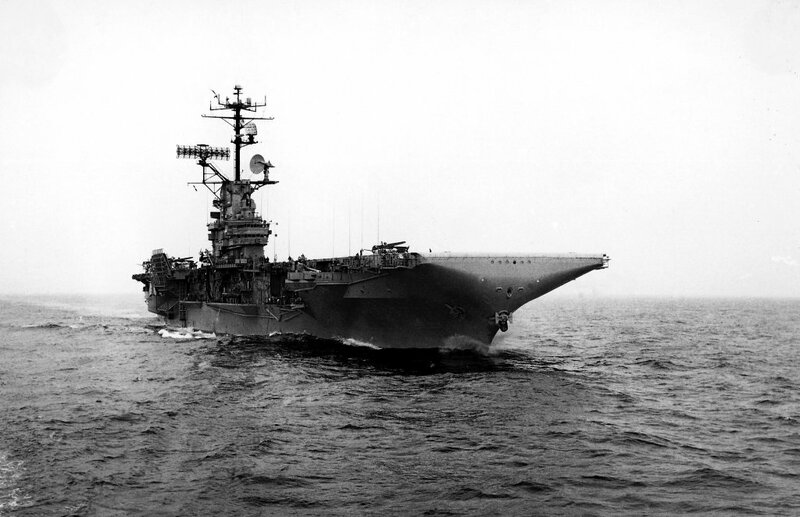 USS Randolph (CVS-15) at sea, 26 August 1966. US Navy photograph by Fred Freidrich (USN 1121397). 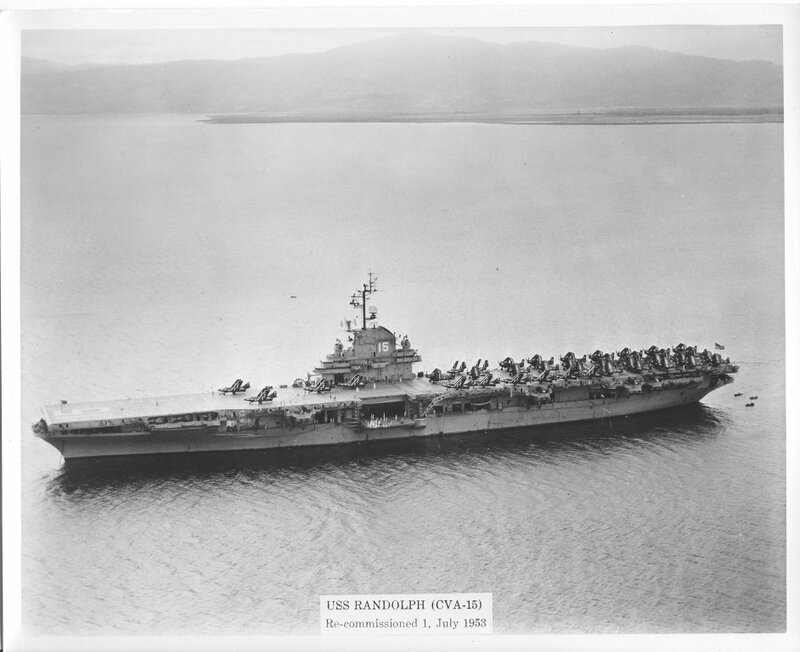 Official U.S. Navy photograph of USS Randolph (CVS-15), serial number K-57262, received by DAVA Still Media Depository, Bldg. 168, N.D.W., Washington D.C. 20374, during September 1968. 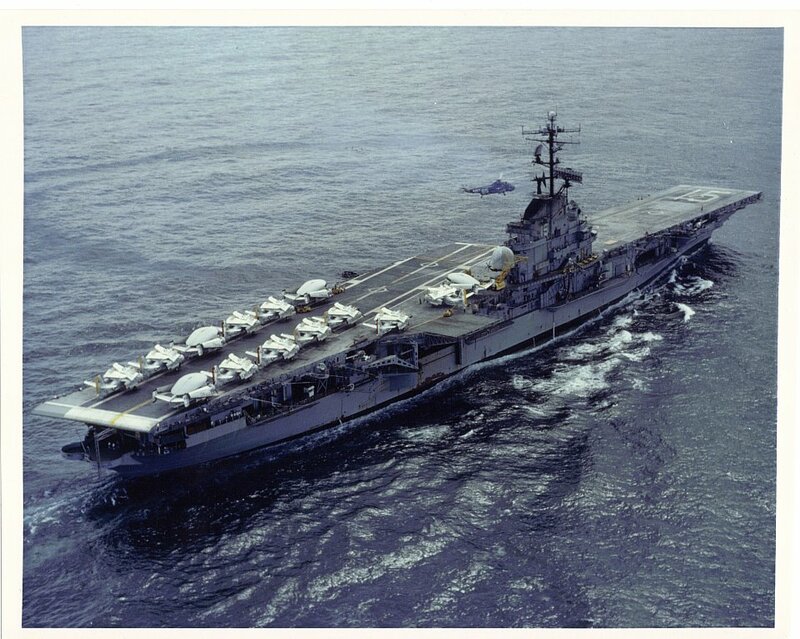 This photo was possibly taken in the summer of 1967, since it shows Antisubmarine Carrier Air Group 56 (tail code "AU") aboard Randolph.